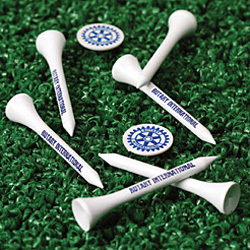 Show ROTARY everywhere you may go. Fiberglass frame, wind-resistant golf umbrella with rubberized handle. 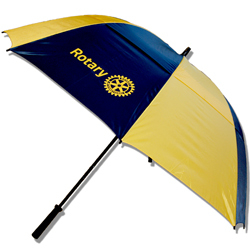 Proudly display the colors of Rotary rain or shine! The ingenious new umbrella with reverse open close technology! 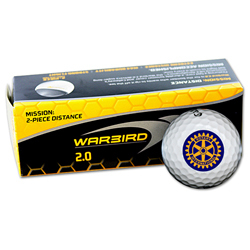 CUSTOMIZE WITH YOUR CLUB NAME NO EXTRA CHARGE. --- Can not be shipped to a PO Box. 5-1/2" wide by 2-1/4" high opaque white vinyl decal with adhesive back. Fits a 2" receiver hitch insert. This sturdy folding camp chair is built to use. Made to hold up to 300 pounds. 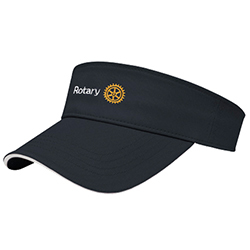 Complement any cold drink with this neoprene beverage holder for cans. Our 12 oz. kitchen-grade stainless-steel "Mammoth" beverage holder is powder coated in blue to provide a non-slip grip and durable finish. Keep your beverage cold with class! Double wall insulated stainless steel travel mug. Suitable for hot and cold beverages. Lifetime Guarantee. Designer, stainless steel, vacuum-seal, double-wall insulated bottle. Capacity 17oz. Think Green! Stop buying bottled water. COMPARE TO YETI -- 20 oz. Mammoth tumbler.